The answer to that isn’t as simple as you might think. My first reflex is always to shrug, smile and go with “I don’t know” (and to some extent that’s true) but the reason why it isn’t easy to articulate that kind of thing over coffee is that it’s complicated and messy and not particularly linear. A lot of things went into the idea, the motivation and the decision to write a story about these characters and what happens to them. It isn’t like I was sitting around one day and a light bulb came on. It’s almost as if the idea for the story had always been there, and to some extent, some hidden part of my brain had been incubating it for me. One day, when it was ready (or when I was ready) the idea just kind of pushed its way up, and that’s when the work began. I suspect that the process is pretty much the same for everybody. Whether the idea is for a story, a photograph, a painting, a song, a product or a business, I think that’s sort of how it works: your brain puts bits and pieces of experiences and ideas together and starts to build the skeleton of something. Most people probably go about their day without really paying attention to that sort of thing, but some of us take the time to stop and pay attention, and sometimes even end up nurturing those ideas until they become concrete, physical things. Okay so… why did I write it? Hold that thought. I’ll get back to that. I need to get into the background of the book first. My original idea for what ultimately became The Nemesis Engines was really simple and sort of silly: a revenge story with a star-crossed lovers back-story, voodoo, Nazis and a reluctant zombie assassin fighting to become human again. The driving force behind the plot were the love and revenge elements, but what I wanted to explore was the gray area between being a man and being a monster. I also thought it was time to bring the zombie genre home to its origins: Haiti, voodoo priests, that nebulous area between myth and science. I’m a big fan of the zombie genre (I love the whole 28 Days Later and World War Z thing where the zombie apocalypse was caused by some kind of virus) and George Romero’s movies robbed me of thousands of hours of sleep when I was a kid, but you know, it’s been forever since anyone did a movie or wrote a book that dealt with the original zombie creature: not a tsunami of “infected” undead laying waste to civilization, but just some poor guy who got on a voodoo priest’s bad side and ended up on the business end of a very bad Saturday night. Anyway, I wanted to explore that side of the mythology a bit because it’s been sort of neglected for some time. The zombie character eventually developed into something far more complex, interesting and badass, but the genesis for the idea was the classic voodoo curse rather than the infected undead. Really simple. Pretty stupid, even, but it was just the kernel of an idea. It was so basic that it could fit on one small notepad page. But… the more I thought about it, and the more I played with the idea, the more it started to grow and improve. The core elements stayed pretty constant, but over time, the world, the characters, the plot, the scale and scope of the story and the universe it all lived in sort of grew into something much bigger than what I had originally intended. By the time I actually sat down to start writing the book, it wasn’t stupid anymore and I had filled two Moleskine notebooks with notes (and was already half way through a third). How did the story also become about World War One? Sometime in 2011, my father was digging through some old family items and he found a stack of letters which he thought my grandfather had written to his parents during WW1. He had never read them. No one had in almost a century. 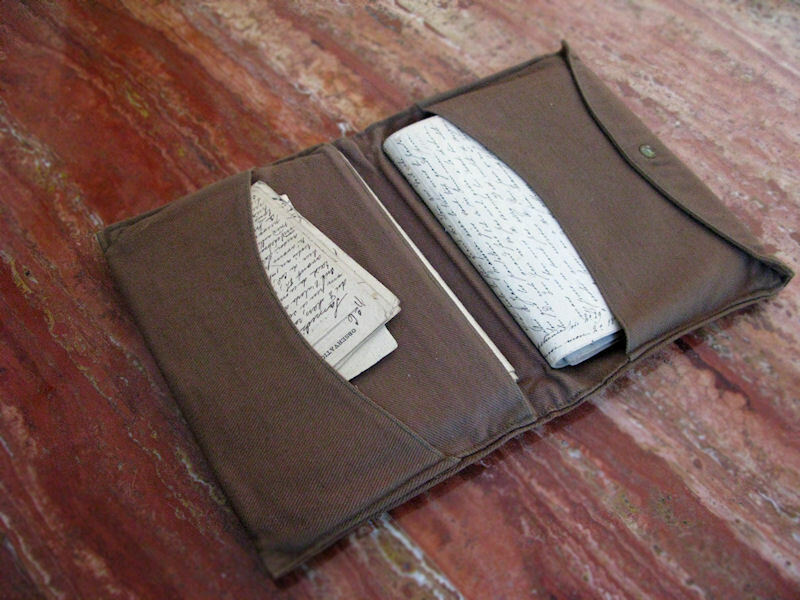 They had been sitting in their original letter wallet for three generations. I immediately started reading them of course, and discovered that they were not, in fact, letters from my grandfather but rather letters to my grandfather, written by his father and mother (separately) between 1917 and 1918. Long story short: I got hooked on the surprising tenderness and honesty I found there, and became fascinated with the amazing amount of detail about life in Paris during the last days of the war. Some of the letters described bombardments by Zeppelin by night and by artillery fire by day, battle reports from the war, politics, food shortages, epidemics, and so on. About five letters in, I started to think that perhaps I should set the story during WW1 instead of the 1930’s… so I did more research on the period. That led me to Winston Groom’s superb book on the Great War – A Storm in Flanders: The Ypres Salient, 1914-1918, Tragedy and Triumph on the Western Front. (An incredible book if you’re a fan of history.) That sealed the deal: WW1 it was. That meant no more Nazi bad guys but the decision led to far more interesting and original villains, so it all worked out. Also, it was entirely coincidental that 2014 marks the 100th anniversary of the start of WW1, but things sometimes have a way of finding their own symmetry. Changing the time period opened up all sorts of new possibilities, the most important of which being a) an opportunity to play with technologies that actually existed in that time period (not exactly steampunk but fans of the genre will feel right at home) and b) the possibility of adding 1915 Paris and the battlefields of the Western Front as set pieces. Both seemed like really exciting ideas, so while the central thread of the story didn’t change, the project as a whole started moving into a completely new direction – one that would be a little more epic in scope and with a lot more action. Somewhere along the way, I started to read the work of Jules Verne: 20,000 Leagues Under The Sea, Voyage to the Center of the Earth, From the Earth to the Moon, Around the Moon, Michel Strogoff, Around the World in 80 Days, The Mysterious Island, The Green Ray, and so on. That led me straight to the work of H.G. Wells, and half way into The War of the Worlds, it occurred to me that it was really too bad that nobody wrote that kind of sci-fi and adventure anymore. I started playing with the notion that since The Nemesis Engines now took place in 1915 instead of the more modern thirties, it would be pretty cool for the book to be an homage to the genre. I started playing around with tone and voice, and ended up writing the first draft in a style that fell somewhere between Verne, Wells and Fitzgerald. (I had just read The beautiful and Damned and Tender is the Night, and the lyricism of Fitzgerald’s prose had a quality that I really liked for the story.) The trick was to find the right balance of period-appropriate and contemporary styles so as to not alienate modern audiences. Surprisingly, hitting just the right balance wasn’t all that difficult, so it worked out pretty well. How did the story go from one novel to three (and perhaps five) books? Some 200 pages into the manuscript, it became pretty clear that what had originally been intended to be a 350-400 page novel should be a 3-5 volume series. I remember sitting back in my writing chair (yes, I have a writing chair), completely dumbfounded by that, and wondering how in the world I was going to pull it off. Writing one book was hard enough, but three, four, five? Could I really hold a story that big inside my head and spend the next few years working on an entire series? (My name isn’t Tolkien or Rowling.) It didn’t matter. I would just have to find a way. I was too far into it to stop or start over anyway, and I really liked where things were going. So… I just kept going. The length and number of volumes was just logistics. If it took ten books to tell the whole story, so be it. I immediately started working on a new structure… which was sort of like trying to completely replace all of the wiring inside of a 747 in mid-flight. It took about a year and a lot of experimentation and rewrites to get all of the pieces to work just right, but the end result was well worth the trouble. The exercise helped me flesh out some side characters, introduce a whole new set piece, create an origin story for the entire series, and add a pretty serious twist to the plot. The really unexpected bonus was that the process of working out the new structure for Volume One ended up giving me the structure for the entire series, not just in terms of story and character arcs, but also thematically. All of the books have different themes: The Peacemakers is a classic hero’s journey. Aside from setting stage for the entire series, it’s ultimately about the idealism of youth and the loss of innocence. And if you remove all the dressing, it’s also a coming-of-age story. Volume Two (Steel and Bone) and Volume Three (untitled) will deal with entirely different themes, and I think that these thematic differences between the books are going to be an added bonus for readers. So… now that we have a little more context: why did I write the book? We finally come back to the original question: why did I write the book? Well… because I had to. Once I started developing the idea, I just got hooked on it. Even when I wasn’t working on the concept, some part of my brain was, and so it kept evolving. Over time, the characters became more more real and interesting, and the world they evolved in grew increasingly intriguing. I reached a point in the process where I just couldn’t not write the story. So… the short of it is that I had no choice. It just got too big for my head and had to come out somehow. Okay, that’s it for now. 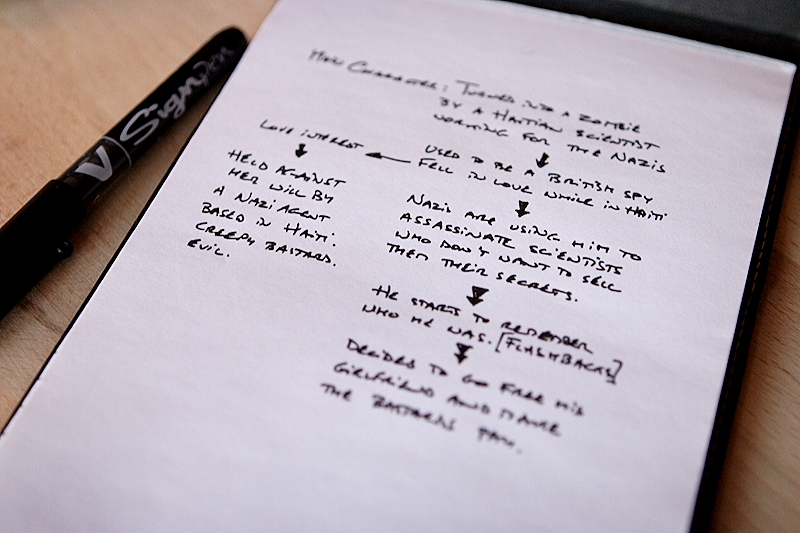 In Part 2, I will talk about the writing process itself: how an idea actually becomes a book. I might even throw in some practical advice. PS: The Peacemakers is scheduled for release in March of 2014. Steel and Bone is due to come out in March of 2015, and if all goes well, the third volume should follow in March of 2016. This is such a lovely peek into your process. Thank you so much. I am anxious to read these! Bravo and well done Olivier!